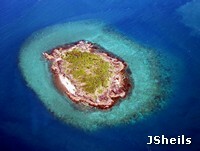 Fringing Reefs are coral reefs that grow on the shallow seabed around the edges of islands and shorelines. They usually have a shallow reef flat extending out from the shore, which is exposed to the air at low tide, and a reef slope which drops off more or less steeply into deeper water. There are often coral bommies dotted along the edge: smaller, separate, free-standing coral structures that can be one single massive coral colony. Drag and zoom on the map below to explore the location of fringing reefs in the Whitsundays. 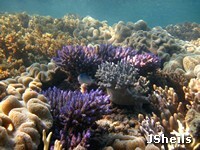 Corals are colonies of tiny animals called coral polyps. They are relatives of jellyfish and sea anemones, and each polyp resembles a tiny, upside down jellyfish sitting in a cup of limestone. 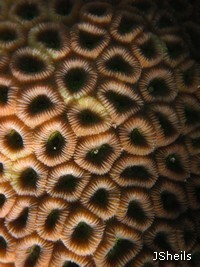 Most polyps are just a few millimetres across and colonies are made up of many thousands of animals. Polyps extend stinging tentacles into the water at night to feed on tiny floating animals, known as plankton. During the day, the tentacles are safely hidden in the limestone structure, out of reach of predators. Coral polyps build limestone structures to protect themselves from being eaten. Each coral colony is like a high-rise apartment building, with the polyps living in shallow cups all over the outside of it. Each species builds a more or less distinctly shaped and patterned building, and there are 359 known species of coral on the Great Barrier Reef, out of roughly 1000 worldwide. The rate of growth depends on the growth form: massive corals grow between 10-20mm per year, while more delicate growth forms, such as branching corals can grow up to 10cm per year. As coral colonies grow and die, the limestone structures that they build pile up, one upon the other, to form the structure of the reef. Reefs grow slowly: the fastest growing reefs can accumulate limestone at about 10kg per square metre per year, or about 7mm of upward growth per year. As corals grow they are also being eroded by storms, predators and burrowing animals, so that the actual reef growth will be less. Building limestone takes a lot of energy and corals need some help. They have a hidden secret. They get more than 90% of the energy that they need to build reefs from an intricate partnership with microscopic algae, single-celled, called zooxanthellae, which live inside their bodies. 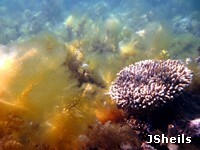 The algae produce sugars from sunlight by photosynthesis, feeding the excess to the corals. 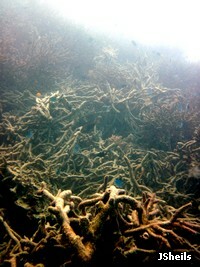 In return, the corals reward them with fertiliser in the form of their waste products. This amazing partnership provides the extra energy that the corals need to build reefs. 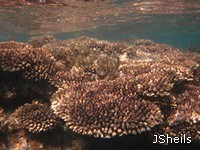 Zooxanthellae also give the corals their brown colour, and the energy to make other coloured pigments. Without their zooxanthellae, coral&aposs tissues are transparent, allowing you to see through to the white limestone beneath. 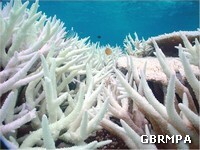 When this happens it is called coral bleaching and is a sign of stress. Corals need a very particular set of conditions to grow. They need the water temperature to be between 18 & 36 °C (ideally around 26-27 °C), a stable pH and salinity between 30 and 40 parts per thousand. The water has to be clean, clear, well oxygenated and low in nutrients. 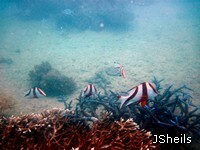 They also need a shallow, stable substrate to grow on and enough sunlight for their zooxanthellae. Because they are so picky, corals are very sensitive to changes in their environment. 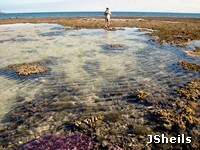 In the Whitsunday region fringing reefs grow on the mainland coast and around the shorelines of the offshore islands, wherever the right conditions occur. They may be backed by rocky shorelines, sand flats and beaches or mudflats and mangroves, and the reef flats are often dominated by algae, with the highest hard coral cover on the outer slopes. Fringing reefs can be very diverse habitats; a single fringing reef in the Whitsundays can have as many as 130 different coral species. The complex habitat built by all of these different shaped corals provides homes for a great diversity of fish and invertebrates; globally coral reefs are home to 25% of all known marine species. Fringing reefs protect shorelines from damage due to storm waves and provide protection to other important habitats such as seagrass beds, mangroves and saltmarsh. 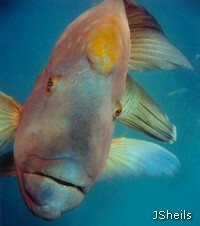 They support many commercially fished species such as Coral trout (Plectropomus spp.) and tropical rock lobsters (Panulirus spp. 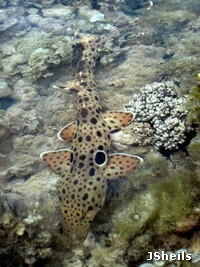 ), as well as many other spectacularly beautiful species that reef visitors come to see. Fringing reefs are important to the local economy because they are close to the mainland and are protected from rough weather by the Whitsunday islands, making them the most accessible and most visited reefs in the region for both tourism and recreation. 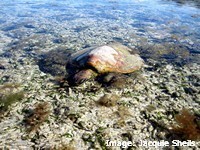 Three species of sea turtles are dependant on fringing reefs in the Whitsunday region; Green sea turtles (Chelonia mydas) and Hawksbill sea turtles (Eretomochelys imbricata) shelter and feed on reefs, while Flatback sea turtles (Natator depressus) feed on invertebrates that live in the shallow, protected waters around the fringing reefs. Protected fish species living on the fringing reefs include Queensland Groupers (Epinephelus lanceolatus), Humpheaded Maori Wrasse (Cheilinus undulatus) and Barramundi Cod (Cromileptes altivelis). 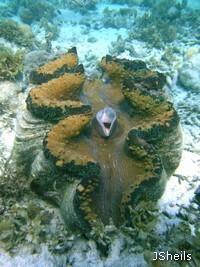 The protected mollusc species on fringing reefs include all Giant clams (Tridacna spp. ), Helmet (Cassis cornuta) and Trumpet (Charonia tritonis) shells, which all depend on reefs for food and habitat. 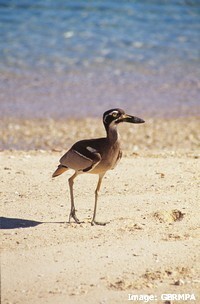 Shorebird species forage for abundant invertebrate food on the fringing reef flats and seabirds feed on fish around the reef edges. Coastal development and changed land use can alter water flows, affecting salinity, sediment and nutrient movements, tidal flushing and erosion in the coastal habitats downstream. Water quality is reduced by runoff from the land containing raised levels of sediment, nutrients and chemicals from human activity. 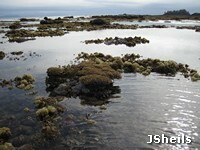 Increased sediment suspended in coastal waters reduces light levels and physically smothers coral colonies as it settles out. 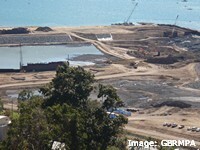 Sediment can bind with nutrients and chemicals from agriculture, sewage outfalls and urban run-off, causing harmful effects on coral growth, reproduction and settlement. Increased levels of available nutrients in coastal waters after major rainfall events have been linked to population explosions of coral-eating Crown of Thorns Starfish (COTS). Crown of Thorns Starfish are a naturally occurring predator of corals, but when their local populations exceed their food supply they can destroy entire reefs. Waves of COTS population explosions have swept down the GBR periodically since they were first observed in the 1960s. 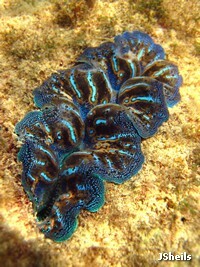 One female COTS can release up to 60 million eggs per year. Their tiny, planktonic larvae are released during the Wet season to coincide with nutrient-fed algal blooms in coastal waters, which supply the food the larvae need to survive to adulthood. The larvae normally have a very low survival rate, but just a tiny percentage increase in their survival can result in enormous numbers of adult starfish, which then have drastic effects on the reefs where they settle. Higher levels of nutrients in coastal waters due to human activity are thought to be increasing the survival rate of COTS larvae, resulting in more frequent and more damaging COTS outbreaks. Because of their position between the land and the sea, fringing reefs are vulnerable to the effects of climate change, particularly sea level rise, increased freshwater flows from storm rains and physical damage from wave action during extreme weather events. The number of severe cyclones (category 4 and 5) has nearly doubled over the past three decades in all the world&aposs ocean basins. On the Great Barrier Reef, cyclone Yasi was one of the worst cyclones to hit the region in recorded history and exposed nearly 26 per cent of the Marine Park to at least gale force winds. While reefs have evolved with cyclonic storms, increased frequency of severe cyclones may outstrip their ability to recover. Climate change also threatens to increase the frequency of coral bleaching events. 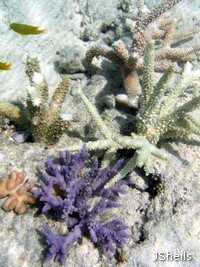 Corals depend on a narrow range of water temperatures, ideally between about 26 °C & 27 °C. Temperatures only one-or two degrees above the normal local range for the season, can cause a breakdown in the relationship between the corals and the zooxanthellae (algae) inside them. Photosynthesis is a temperature dependant chemical reaction; it speeds up at higher temperatures. As the rate of photosynthesis increases, waste products build up that damage coral tissues. 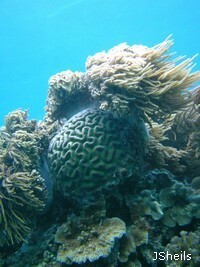 Eventually the corals can&apost take any more and they throw the zooxanthellae out. The zooxanthellae give the corals their colour, so corals that have lost their zooxanthellae turn first fluorescent colours, and then white. This is called coral bleaching, and when it&aposs due to high sea temperatures, it can occur on a scale that can be seen in satellite images. Since the zooxanthellae give the corals up to 90% of their food, bleached corals are weakened, and will die if the stress that causes the bleaching continues for too long. 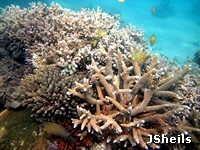 Corals that recover from bleaching are still weakened for some time afterward. 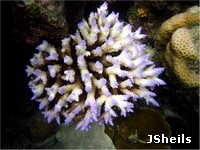 Ocean acidification due to increasing levels of CO2 also threatens the survival of coral reefs. As carbon dioxide gas increases in the atmosphere, it also dissolves in the sea. In the sea, CO2 forms carbonic acid (H2CO3), which increases the acidity of the seawater. Between 1751 and 1994, surface ocean pH decreased from about 8.25 to 8.14. It doesn&apost sound like much, but because the pH scale is logarithmic, this represents an increase of almost 30% in acidity. Increased acidity of seawater weakens the limestone structure of reefs, and also reduces the coral&aposs ability to lay down more limestone. Join a local conservation group! Water quality begins at home! Remember that the chemicals you use around your house and at work will ultimately end up in the sea. Use environmentally friendly chemicals; avoid artificial herbicides and pesticides if you can. If you have to use harmful chemicals around your house, follow the instructions on the label carefully and avoid uses that might let chemicals wash into drains or waterways. 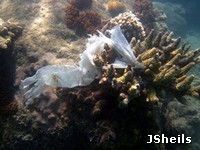 Avoid littering the marine environment and pick up litter whenever you can, even if it isn&apost yours! Are increased nutrients responsible for more outbreaks of Crown of Thorns Starfish? An appraisal of the evidence.